A friend named Ken Kosich had invited our entire Rotary club to come visit his fledgling family vineyard in Napa Valley, an hour drive from where we hold our weekly meetings in Lafayette, California. A couple dozen members, I among them, showed up to enjoy together a beautiful autumn afternoon and, not incidentally, to participate in a guided tour of his 2.5-acre vineyard, home to some 3,500 Chardonnay and pinot noir grapes. This marked the inaugural harvest of the four-year-old vines Ken and his wife Patti completed construction of a vacation home there only a year ago. It’s very nice, about 2,700 square feet and air-conditioned, of course – Napa Valley gets very hot. Although you would never know it, the house is modular, consisting of three sections, each hauled in on huge flatbed trucks and assembled on site. Neither Ken nor Patti touches so much as a single leaf or grape. Everything is professionally managed. They sit back – writing checks liberally, naturally – and enjoy the fruits of the hired hands’ collective labors. Because the winery is not bonded by the state of California, none the wine bottled may be sold commercially. The wine that is bottled is strictly for private consumption by family and friends. Since picked grapes must sit for a year or so after being processed and stored in oak barrels to age, there was no wine of theirs for any of us to drink … but there will be a year hence. 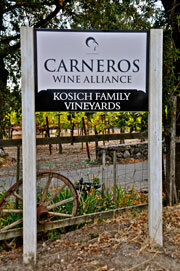 We’re all hoping we are invited back to savor 2010 Kosich Family Vineyard wines. After thanking Ken and Patti for the privilege of seeing a vineyard up close and personal, I headed to Sonoma in search first of gasoline to replenish a nearly dry tank and then in search of photo ops. I was, as they say, loaded for bear. Even before reaching the filling station a few miles up the road, while stopped at a traffic signal I espied a very old pickup truck in the distance. Between it and me was a wire fence secured by a gate which, in turn, was secured by chain and industrial-strength padlock. I’ve encountered more than a few seemingly impenetrable fences in my photographic travels, and never before have I been deterred … that is, unless I should happen to see or hear a snarling attack dog or a snorting bull or a farmer toting a shotgun. I am pleased to report that none of the aforementioned has yet to occur. I parked the car on the shoulder of the road, grabbed my camera and looked for a low spot in the rusty wire fence to crawl over. Just as I was about to give up I found one. Looking about to ensure no one was looking, I crawled over – careful not to snag my pants – and made my way to the truck, beckoning me forth from perhaps a hundred yards away. Uncannily good at recognizing makes of vehicles, I said to myself as I approached, “I’ll bet that’s a Chevrolet.” A Chevrolet it was indeed, a flatbed from the 1920s. Nestled snugly alongside an old fruit stand, it was less than ideal for taking what I refer to as in situ photographs. Happily, however, did I settle for close-ups. I took shots of every portion of the truck – front, rear, doors, even a tire so ancient the cords where dangling through the sidewall. Because it was late afternoon, the sun was casting shadows. Depending on what image one wants the camera to capture, this can be good or bad. As I gazed at the side of the hood, I noticed that the lift handle produced a large, hook-like shadow that I found aesthetically pleasing. Here it is, reproduced with a special “posterizing” graphic effect applied. As I was snapping pictures – looking over my shoulder periodically to see if anyone or anything untoward was advancing – I got to wondering who this “Mr. Bee” might have been. Presumably, a pumpkin farmer. Still in business? Still alive? Who knows. 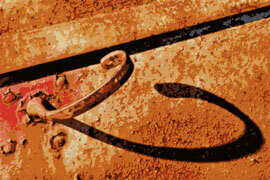 This is one of the things I find so fascinating about the vehicles I shoot. Every single one tells a story. If only each of the trucks and cars could talk! 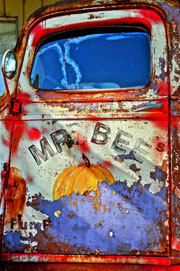 Done shooting Mr. Bee’s forsaken truck, I snapped the cap back on the camera lens and returned – neither torn pants nor embedded buckshot as a souvenir – to my car. Not more than ten minutes down the road – State Highway 29 – I found a filling station. After pumping $45 worth of Shell petrol into the tank, I proceeded into downtown Sonoma. There I managed to find a parking spot – amazing, considering how much traffic there was – turned off the ignition, and sauntered casually to a locally famous cheese shop. Having made my purchase – several varieties of cheddar – I returned to the car, only to discover a very dead battery. AAA came to my rescue, jumped the battery in a trice, and I was on my way back home. Moral: No two photographic adventures are alike. This I find endlessly alluring, even adventures sabotaged by an R.I.P. battery.